The essential plot rundown: Bruce Lee sneaks around killing people. Bruce Lee's last movie; my first Bruce Lee movie. Ok, this movie was obviously made in the 70s. Some older movies age well. This one did not. Everything about it screams "70s! ", especially the soundtrack. But don't get me wrong, Lee is an amazing fighter and he dominates in this role. And it was an entertaining movie. But that doesn't make it any less campy. 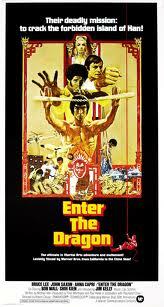 The movie begins with Lee at his temple beating up some poor guy. Then he is given the task of redeeming the temple's honor by defeating a former student, Han. I always thought that martial artists usually have some kind of code, where they don't kill unless they have to, like Batman or something. But, Lee goes on a rampage on Han's island, killing everybody without a second thought. It's not that big of a deal (let him murder whoever he wants). It just struck me as kind of weird. But then again, no one ever forbid killing, so it must be ok.
Lee also has a personal vendetta against one of Han's guys. So when they eventually fight, it was the moment I've been waiting for. I was expecting an intense action scene, with the two dueling it out. But, Lee literally whomps on the guy; he never had a chance. This is the only character that had a real connection with Lee's character. So normally in situations like this, the bad guy has the upper-hand, building tension. This makes the audience antsy, waiting to see how the hero is going to win. Then something happens, the tables turn and the hero emerges triumph. But, in this fight Lee goes in and makes the bad guy look like a sissy right from the beginning. There was no real glory in his vengeance. That is probably the biggest problem with the movie. Bruce Lee is so badass that you are never worried about him. There is no momentum, no tension buildup. Nothing is really at stake. He just tiptoes around and kills everybody. There is never a moment when he is in real danger. 50 guys come; he takes them all down in 30 seconds. He makes all of Han's guards look like Stormtroopers. The end fight with Han was also a little disappointing. I really liked the setting, placing them in a room full of mirrors. It did add to the scene, making it a little more intense. However, because of all the mirrors, they spend 2/3 of the time just looking for each other and not actually fighting. But, luckily for Lee, his sensei/boss/teacher/I can't remember exactly made a very wise comment at the beginning, which allowed Lee to remember it during the fight, giving him the upper-hand. It was fun to watch. Bruce Lee was awesome. There's not much in terms of plot and what not, but the fighting definitely made up for it. I would recommend it but this movie totally ripped of Mortal Kombat.